Direct Drive performs in any environment and is ideal for those experiencing vibration, pulsation and shock. The primary advantage of Direct Drive Pressure Gauges over conventional C-tube gauges is simple, there is only one moving part. Perma-Cal® gauges feature a unique helically-would Bourdon tube attached directly to the pointer shaft. No gears, linkages, or springs to wear or break. 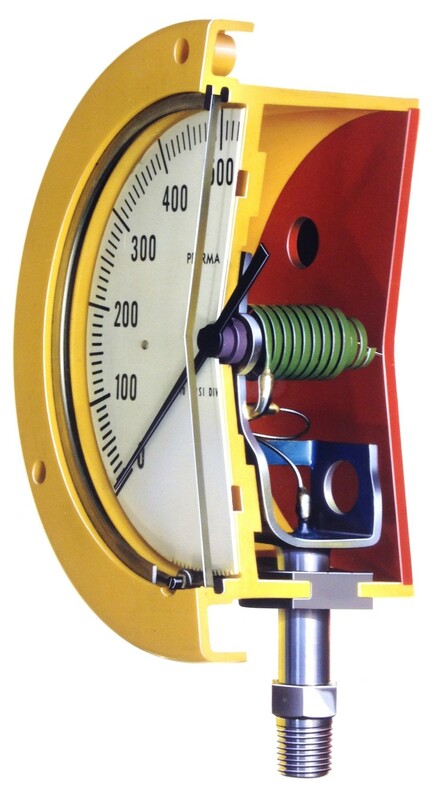 This provides a very linear reading gauge that maintains its accuracy, and eliminates the need for any movement-amplifying gears or linkages (the parts of a C-tube type gauge that fail most frequently). Perma-Cal® gauges maintain their structural integrity and accurate calibration in the most demanding environments, even during prolonged and rugged use. Additionally, Perma-Cal® gauges withstand a 50% overpressure without shift in calibration. Internal pointer dampening and Direct Drive technology eliminate the need for liquid fill, a primary culprit to the premature failure of C-tube gauges. Our gauges do not suffer from the problems liquid fill is designed to solve. Because of Direct Drive, there are no gears, linkages or internal mechanical components requiring lubrication. Perma-Cal gauges offer greater longevity than liquid-filled gauges without the mess or problems of liquid fill.